I should have known better than to re-watch John Carpenter’s The Thing last weekend because one day later, Shout! Factory announced a release Carpenter fans have been clamoring for, for a long time—The Thing Collector’s Edition. In the winter of 1982, a twelve-man research team at a remote Antarctic research station discovers an alien buried in the snow for over 100,000 years. Soon unfrozen, the form-changing alien wreaks havoc, creates terror and takes on the appearance of those it kills. This chilling sci-fi thriller that raised the bar on shocking special effects (effects which still hold up incredibly well, I must add) has long been a favorite among horror fans and the news that Shout! Factory is giving the movie its dues feels like a prayer being answered. The release will feature a brand new transfer of the film, taken from the movie’s original inter-positive, supervised and approved by director of photography, Dean Cundey. It is supplemented by a 4.1 DTS HD audio track that is taken from the original 70mm six-track soundtrack. The release also contains a new Commentary Track featuring Dean Cundey, the man who defined the look of many of John Carpenter’s films. There will be a solid bunch of other brand new bonus features,, such as The Men of Outpost 31 featuring interviews with Keith David, Thomas Waites, Peter Maloney and others. Assembling and Assimilation is an interview with editor Todd Ramsay and Behind the Chameleon is an interview featurette with visual effects artists Peter Kuran and Susan Turner, special make-up effects artist Rob Burman and Brian Wade and others. Sounds from the Cold offers up interviews with supervising sound editor David Lewis Yewdall and special sound effects designer Alan Howarth, while Between the Lines is an interview with novelization author Alan Dean Foster. In addition to these new supplements, the release will also include virtually all of the bonus materials that have been included in previous releases of the movie on a variety of home video formats. Because of their age, these supplements will be presented in standard definition only. Spearheading these supplements is, of course, the iconic Audio Commentary by director John Carpenter and actor Kurt Russell, as well as the 80-minute Documentary “Terror Takes Shape” on the making of “The Thing,” featuring interviews with John Carpenter, Kurt Russell, special effects make-up designer Rob Bottin, legendary matte artist Albert Whitlock plus members of the cast and crew. 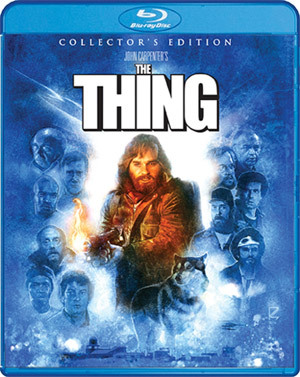 Also included are Outtakes, Vintage Featurettes from the Electronic Press Kit featuring interviews with John Carpenter, Kurt Russell and Rob Bottin, as well as the vintage featurettes The Making of a Chilling Tale and The Making of The Thing. Also look for the Vintage Product Reel that contains a promotional, condensed version of the film with additional footage not in the film, and Vintage Behind-the-Scenes Footage, as well as an Annotated Production Archive, with a look at the Production Art and Storyboards, Location Scouting, Special Make-up Effects, and Post Production. The Network TV Broadcast Version of “The Thing” will also be included, along with a variety of Trailers, TV Spots and Radio Spots and a Still Gallery, filled with behind-the-scenes photos, posters and lobby cards. 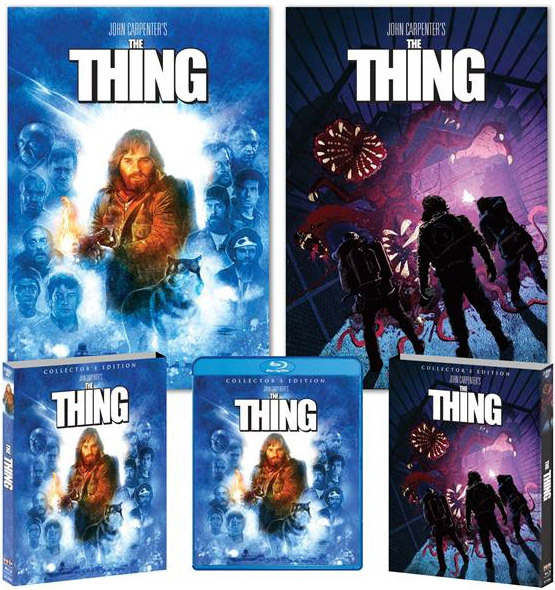 The 2-disc The Thing Collector’s Edition will arrive on September 20 for $34.95 with a newly rendered cover artwork and a reversible cover wrap featuring the original theatrical key art.